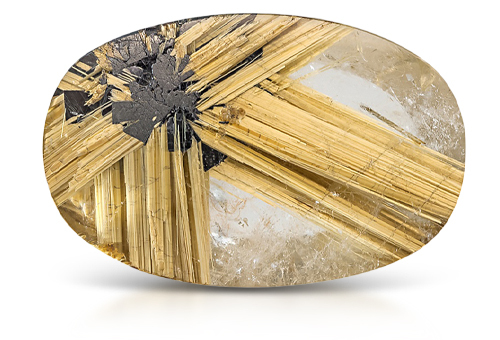 The name rutile comes from the Latin rutilas, meaning "reddish," as this mineral is usually red to golden in color. Rutile forms in a wide array of habits, and is often seen as an inclusion within gems, either in large needles that make bold patterns, or fine, microscopic fibers that cause chatoyancy and asterism in gems. It is highly refractive, and is occasionally found in facetable sizes. High luster, extreme fire, OTL RI reading, eye visible doubling, poor polish. Rutile often is seen as golden needles in other gem materials. Synthetic rutile is used as a diamond simulant.